John Lessore was born in London in 1939 and grew up amid a family of practising artists including his mother, the painter Helen Lessore. He studied at the Slade School of Fine Art under William Coldstream (1957-61), then travelled in Italy on an Abbey Minor scholarship. He is a co-founder of the Royal Drawing School (established 2000) and was a trustee of The National Gallery, London (2003-11). He taught at the Royal Academy Schools (1965-99) and co-ran the Life Room at Norwich School of Art with John Wonnacott (1978-86). He lives and works in London, East Anglia and France. John Lessore rarely paints from life, working instead from sketches, memory and the imagination. 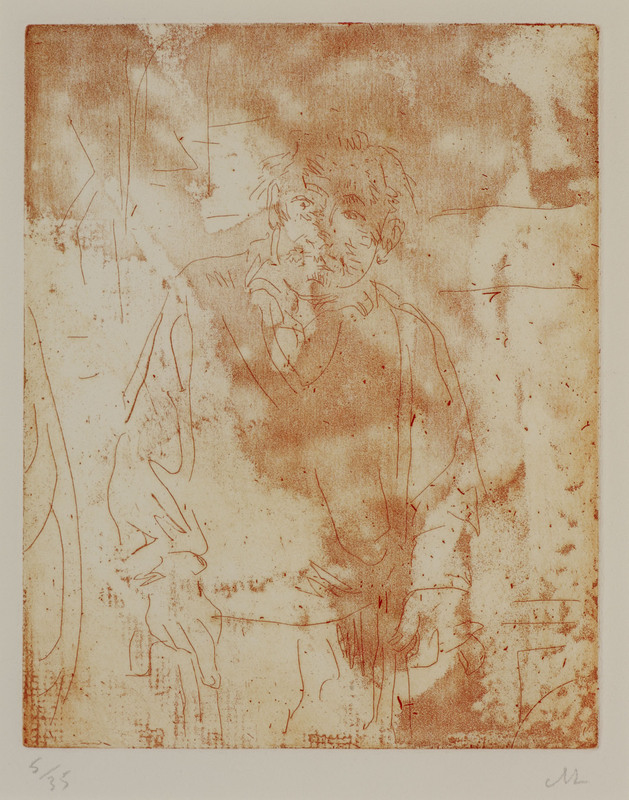 Figurative but not descriptive, Lessore’s portrait etching of artist and fellow tutor at the Royal Academy of Art, Denis Lucas, is half hidden and half revealed, softly printed in brown ink.